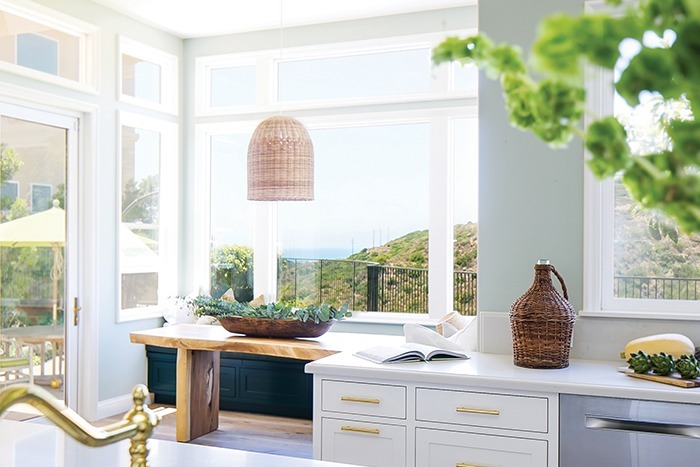 Our latest Project Spotlight features an Orange County kitchen that transformed from a small and closed-off space to a hip, spacious kitchen-great-room that now highlights its views of the Newport Coast. 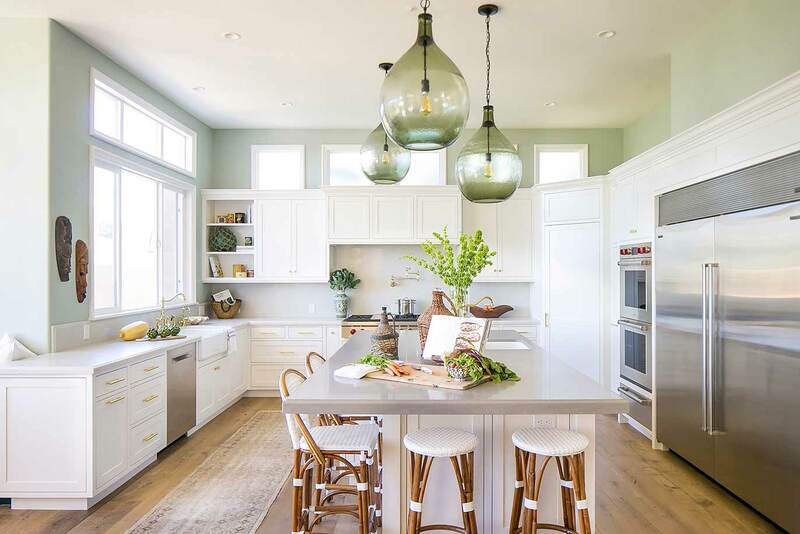 The original kitchen felt small and constricted, in part, because of a bulky island and peninsula that prevented a clear connection with its surrounding areas. The new design focuses on function and a more transitional style that blends contemporary aesthetics with classic or traditional style details. Arizona Tile’s New Carrara Quartz backsplash brightens the room and complements the custom-made paint used on the upper walls. The angled pantry in the northeast corner maximizes storage space that was not there before. 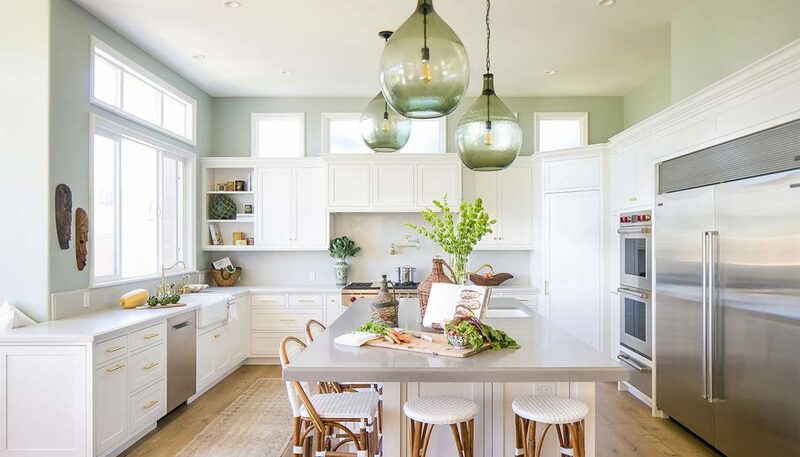 To implement more calm and earthy tones within the space, Pottery Barn’s Clift Seeded Glass Pendants were anchored above the island. 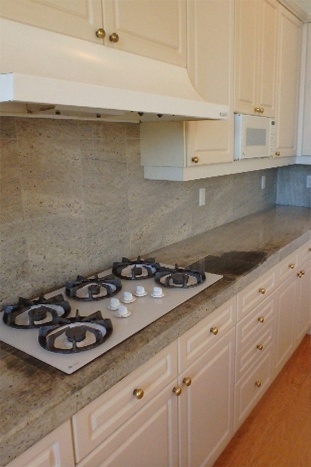 To see more ways to implement this unique detail, check out Houzz. 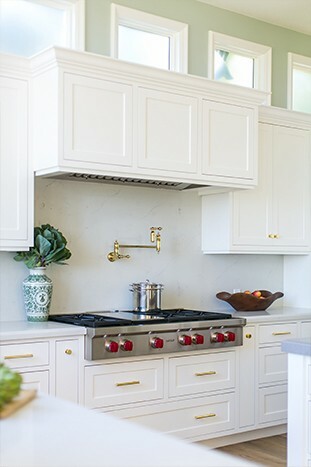 The powerful and commercial grade, range-hood is elegantly hidden behind shaker style detailing to seamlessly blend with the rest of the crisp white upper cabinets. The new Wolf 48″ Sealed Burner Range Top is spacious with 6 individual burners, and the continuous porcelain-coated, cast iron top grates allow for easier use with any pan. It’s important to know how to find the right cooktop for your kitchen. Read more helpful hints to better decide what works best for you and your needs. 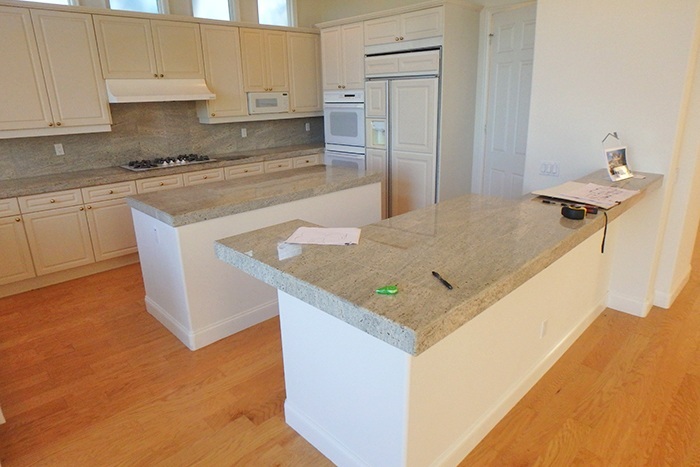 Another nice point to note, is how the front profile of the range mimics the height and edge detail of the counters. The pot filler, Kingston Brass Swing Arm Wall Mount, is in a bright, polished brass finish that matches the Omnia polished brass cabinet pulls and cabinet knobs, allowing for continuity throughout. The shaker-style detailing continues into the breakfast nook area, and the panels seamlessly disguise the storage drawer built into this custom banquette. This corner bench offers the coziness of a booth and the ability to enjoy the dramatic views of the ocean, canyon and city lights of the Newport Coast. 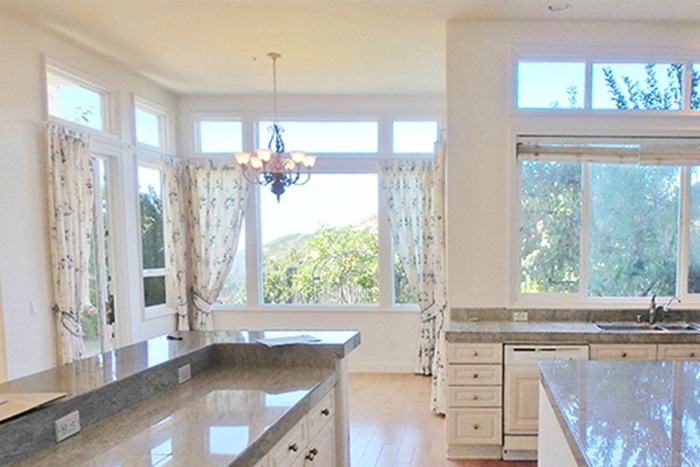 The dark navy colored seating beautifully contrasts the bright colors used throughout the rest of the kitchen. See similar color combinations to inspire you for your next remodel. 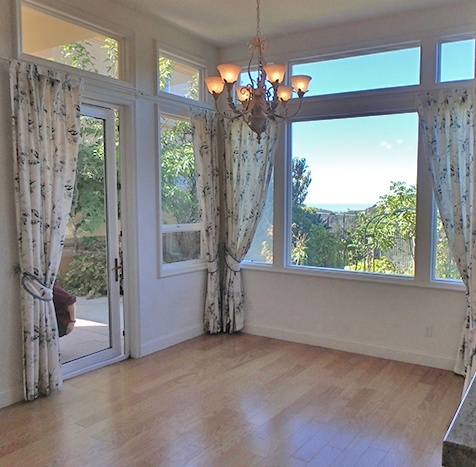 For even more photos of the Sugar Pine Residence, be sure to visit the project portfolio on our website.